Once upon a time there was a tiny round ball made from Earth. The ball grew and grew until it could fit into the palm of our hands. That is how we start our clay session – with a story. 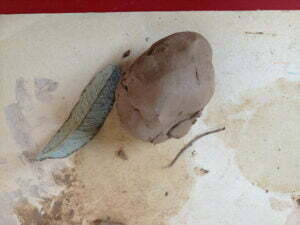 The children assemble the ball by gathering clay and rolling it between their hands. The kids make small and big balls, long and short sausages with clay, they cut the clay with their fingers and print into it with shells, stone sand leaves. This is a sensory experience that involves feeling the material. “It is squishy, its cold, it is soft or hard, rough,it is dry and when we add water it gets wet and smooth.” It changes in the process and can reflect how we feel, how much pressure we put into it or how soft we press it. The children realize that their action has an effect on the clay, they can mould and fold it and it becomes a piece of material in which they can express themselves. Clay work lends itself to enhancing Motor skills, self expression, creativity and confidence as the clay creations grow with practice and skills. We offer clay regular in our early learning program and with its substance it always brings so much solid holding and space to explore in a safe place to the children’s hands and minds. It has an overall calming effect especially for children who are hyperactive or anxious. Overall it is messy and wonderful and encourages to PLAY.